In war, there is a famous phrase: "No plan survives contact with the enemy." Away from the battlefield, nowhere is this truer than in the world of construction. Even the best laid plans fall prey to the need for alterations, rescheduling and different skills required on site - all of which can impact on construction's traditional enemies of time and cost. Add Sustainable Urban Drainage Systems (SuDS) into the mix - a relatively new and less well-known construction method, which has regulatory backing but no clear construction guidelines - and it is little wonder that some constructors regard sustainable urban drainage as a headache. Drainage has a huge capacity to interrupt construction plans, as it is one of the first stages of a build. Get out of sync on timing and the impact on costs and resources can be catastrophic. New regulatory guidelines that are dependent on project type, and even the area in which a build is located, mean any alterations can present difficulties. Nevertheless, sustainable drainage is now an essential element of UK construction, but there are still barriers to uptake, from a client, constructor and environmental perspective. This is not a new subject, but the construction industry, understandably, has difficulty interpreting the guidelines. A recent survey conducted by ACO revealed that 68% of construction professionals felt there was a lack of understanding of SuDS among key decision-makers. What's more, over 50% of SuDS experts recognised that "site constraints" posed a real difficulty in design and construction. ACO has been working with a SuDS Task Group to deliver sustainable solutions on sites. The outcome is clear guidance on how to deliver "achievable SuDS", ensuring that they are planned early and potential obstacles are factored in. The secretary of state for communities and local government has required Lead Local Flood Authorities (LLFAs) to provide guidance on the management of surface water to local planning authorities. The local authorities need to satisfy themselves that the proposed minimum standards of operation are appropriate and ensure, through the use of planning conditions or planning obligations, that there are "clear arrangements in place for ongoing maintenance over the lifetime of the development". Resilience This means expecting the unexpected, which for SuDs means that failure is inevitable, because of the nature of storms. What matters is that a scheme �fails gracefully�, not catastrophically, and the system is able to recover. Adapting or designing systems that can deliver the benefits of these four pillars can prove to be problematic, but is achievable. ACO supplies projects that range in size from a fraction of a hectare up to several hectares - the typical area of focus for SuDS. It is possible to achieve positive outcomes against the "four pillars" ambition through a combination of soft and engineered solutions. Moreover, it is also important to consider constructability and cost as well as maintenance. These considerations are particularly important in situations where the constructors are having to adapt designs during the build process. The incorporation of engineered products in SuDS schemes is relatively easy from a construction perspective. 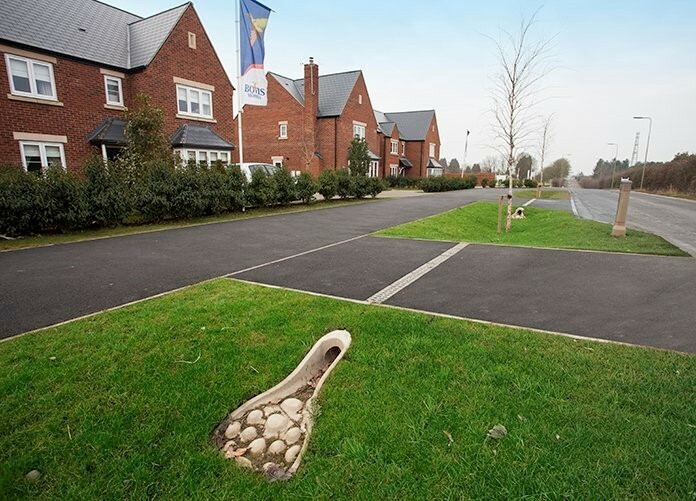 "Soft" SuDS elements - those that make use of green landscaping - are very different and require careful attention, not least because they need to be protected from damage during the ongoing construction programme. Compaction, pollution, erosion, silt or sediments can all cause significant ongoing problems - or even failure - if they are not properly planned for. ACO's oil/petrol separators can take years to fill, but the removal of material is relatively straightforward with the use of a suction device. 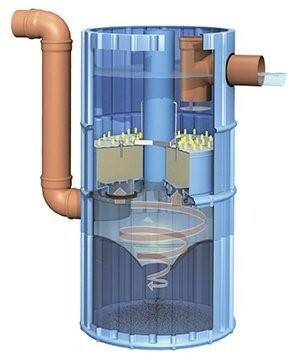 More advanced filtration systems work where material is vacuumed out, with only the filtrate requiring replacement. Allowable discharge rates are frequently now set to "greenfield" levels. A site that has previously been developed may have a higher rate than greenfield. The rate and maximum volume for an impermeable surface happens more quickly and is far greater than that of the permeable surface. The key is to manage the rate economically and sustainably while still being resilient. Geocellular storage structures, which are normally modular, accessible and sub-surface, are often used to manage rate. Designed to withstand a variety of loads, the best systems can be constructed to form large integrated tanks that are easily maintained during and post construction. Typically, they are used in combination with flow controllers like ACO's Q-Brake, which controls water release. Human activities produce pollution - deliberate or accidental, chronic or acute. This is particularly true for surface water. The type of pollution does need to be carefully considered at design stage, as very specific controls are often essential. A typical example would be on a petrol forecourt where very specific requirements are laid out. My advice to the construction industry is to get advice from manufacturers who spend their time developing SuDS products and, crucially, understanding the regulatory environment. That advice needs to be accessed as early in the project as possible because it is in the early stages that potential problems can be unearthed and solutions put in place. We're here to help - and, ultimately, to help you save time and cost. What's driving the flow of SuDS? The growing population is providing a major challenge for UK infrastructure, with projections forecasting an increase of 9.7 million over the next 25 years, resulting in a total UK population of 70 million by mid-2027, according to predictions from the Office for National Statistics. 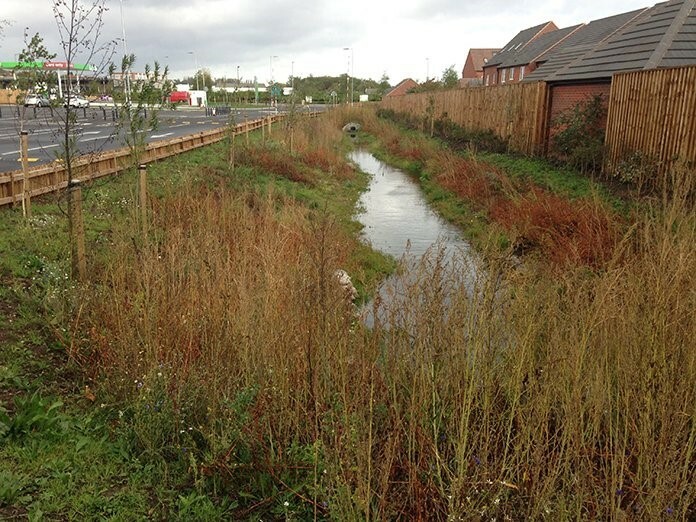 The UK has seen both a dramatic increase in impermeable surfaces being created and a reduction in key wetland areas - a combination that creates drainage and water management challenges. The Coordination of Information on the Environment (CORINE) land-use change map details that 2,500 sq km of land has been altered in a six-year period between 2006-2012. If this land has all been made impermeable, the runoff caused by 10mm of rainfall is roughly equivalent to 2.5 days' worth of water consumption for the whole population (150 litres/day/person x 60 million). Climate change is increasing rainfall, which is predicted to rise by about 20% in the next 40 years, and is also increasing the intensity of storms - which has a direct impact on the amount of flooding. We may have more water but we still have a water supply deficit. England, Scotland and Wales are projected to be in deficit by 800 million to 3 billion litres per day by 2050 (5-16% of total demand) and by 1.4 billion to 5 billion litres per day by 2080 (8-29% of the total demand). SuDS are a key part of the solution, infiltrating water into the ground to assist in the replenishment of ground water. We don't design or build SuDS, but our off-site solutions centred around timber can help you save massive amounts of water during the construction process. Timber is now making strong progress that to become the material of choice for designers, engineers and developers. These challenges further emphasise the role for Off-Site DfMA (Design for Manufacture & Assembly). They also point up the need for greater collaborative 'partnering' between architects, builders and manufacturers. The greater speed, accuracy and quality that can result from manufacturing components in a dry, controlled factory environment gives builders a much better chance of achieving improved on-site build quality AND controlling costs. While resistance to the change to DfMA has been the norm, the wish of most UK Builders to deliver excellent customer service and top notch homes is now driving an increasing number to choose Off-Site for their developments. Also, as 'OffSite Hub' note, architects and designers are moving toward DfMA, something w have been encouraging for over 20 years. The emergence of LA Developers will only speed up this process.